Cinnamon. Ginger. Cardamom. I'm wrapped in a blanket of warm spices. Add a pinch of saffron and you have the colour of the sun as well! The smells from this dish was absolutely intoxicating. I was excited to see "Chicken B'stilla" on the January schedule for FFWD a few weeks back. It was a recipe that had intrigued me when I had first picked up my copy of Around My French Table and was flipping through the book. 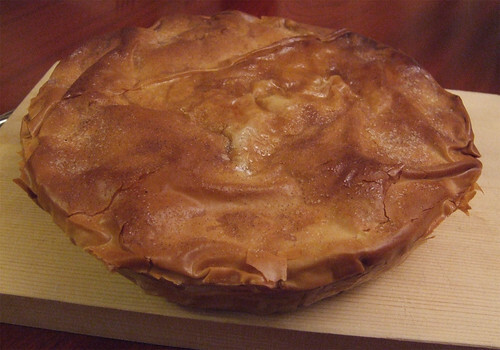 This is Dorie's adaptation of a popular Moroccan meat pie called b'stilla (or alternatively known as pastilla). The original version typically uses pigeon, but Dorie has swapped it for the more easily accessible chicken. 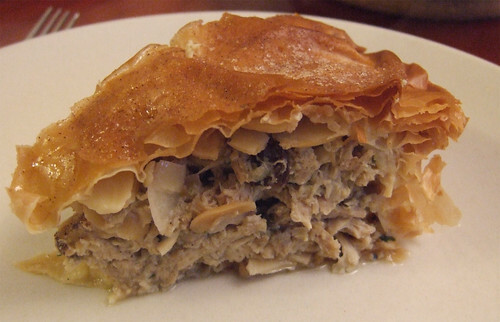 The fragrantly spiced meat filling is then layered between paper-thin phyllo dough, and dusted with sugar and cinnamon on top. This is yet another dish that can easily be prepared ahead of time and make for a quick and easy meal on a weeknight. I made the filling a day ahead, which also allows the spices to really work its way into the chicken and helps thicken the sauce after being cooled in the fridge. All I had to do was assemble the pie and bake it the next evening! With all the different spices, your house will smell so, so good, both when you're making the filling and then baking the pie. 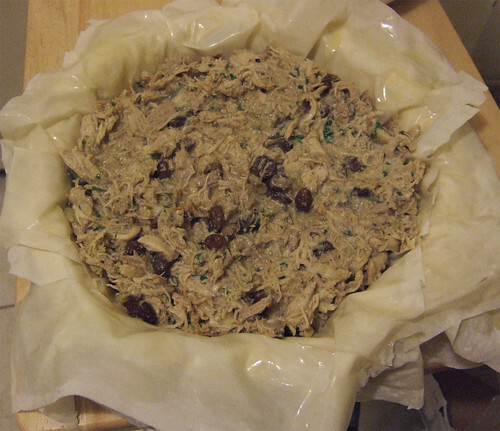 I threw in a handful of soaked raisins for some added sweetness to the b'stilla, and baked it in my ceramic pie dish. Mardi @eatlivetravelwrite January 28, 2011 at 8:48 a.m. I was blown away by how amazing this dish was. Will definitely be making this again!